With school ending for children and the weather getting warmer, the roads are getting riskier. The dangers of many types of motor vehicle accidents increase during the summer months. One particular type of bike accident which is more likely to occur is bicycle collisions involving younger children. If a motorist and a child become involved in a bicycle accident, it is important to determine who was at fault and how the crash occurred. Drives can often be held wholly or partially responsible for bike accidents involving children because drivers have a basic obligation to exercise reasonable caution while driving. If they fail to follow rules of the road and don’t watch carefully for kids, drivers could be held liable of all losses and damages. Boston bike injury lawyers can help parents of children who were hurt in bike crashes to find out what options they have for taking legal action and making a driver pay for losses he has caused. According to the bicycle safety advocacy groups, more bicycle injuries occur from May through September than during other times of the year. Approximately 11 percent of victims killed in bicycle accidents are children, and older children between the ages of 10 and 15 are actually the group with the biggest risk of bicycle accidents, although many people mistakenly believe younger children would be at a greater risk. Older children tend to bike later at night than younger children do, and often without supervision. 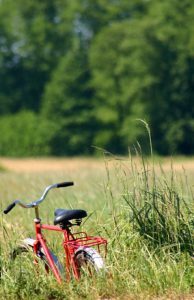 Older children may be more prone to longer bicycle rides, including through busier areas, as they use bicycles as a means of transportation to do activities when they are still too young to have their own cars. While younger children may bike around driveways and throughout more residential neighborhoods, they are typically better supervised by parents and less likely to be out on bicycles when it is getting close to dark out and when they would be more difficult for drivers to see. Children of all ages, however, are more likely to be riding bicycles for recreation during the summer months, as opposed to simply riding bikes to school or not riding at all because of weather or busyness with other activities. When children are out of school and ride bikes, their routes are also typically less predictable. All of this means drivers are both more likely to encounter children on bicycles during the summer, and are more likely to have an encounter with a bicycle which is not a part of their normal routine. While drivers who regularly see children commuting on bikes to school daily will be more attuned to watching out for children bicycling, drivers not used to seeing young bike riders on the roads may not be paying as much attention as they should and could strike a bicycle rider.